Fresh snow on the ground yesterday morning – at least two inches of the stuff. By this morning the pavement was bare; by noon the temperature was above zero. Slow and easy getting started: bike down, find the clothes that were tucked away last November, inflate tyres, wax the chain. Water, don't forget water. Take a photo on the north side of the house were it still looks nice and wintery. Slow and easy getting started: feel the wind on the face and put on a smile. Nod to others who are out for the first time in months, cautiously restarting their engines. No ice on the roads but lots of melt water. 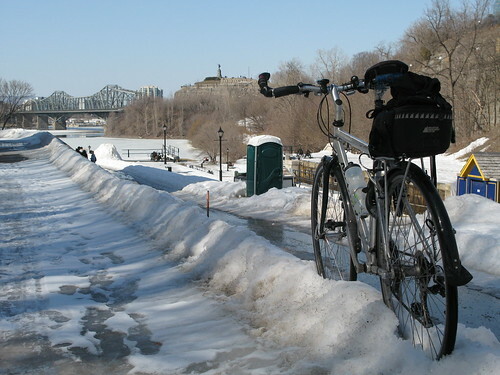 It will carry lots of salt from the roads – remember to wash off the bike when I get home. Too warm – shed some clothes. Stop for a photo-op. Still too warm – shed more clothes. Feel the breeze through my sweater. Down to the river. The shadow of parliament is deep and long – too long: the paths are still icy and slick with water. Time to turn around. Ponder supper on the way back. Consider picking up some groceries en route – heck, if Alan can do it, why can't I? Mushrooms, thyme, rosemary and asparagus – it will all fit on my back rack. Headwind – forgot what that felt like. It feels great! Who cares if it turns the ride into a slog? I'm all soft and slushy, just like the snow. Serious training needed, no question, but not today – today is like a stroll in the park, nice and easy. Everything's a mess by the time I get home. Who cares? It's the earliest first ride ever. All hail Global Warming! Posted by Kern on March 11th, 2012. It's the earliest first ride ever. All hail Global Warming! I think it's the asparagus Kern. I learned today it has a massive carbon footprint. Bananas on the other hand (remember Alan's bananas?) have one of the lowest. Nice post anyway. Good feeling. Love the photo by the river. If thats how it looks when you reckon its safe to cycle I dread to think how it looked before! Is Titanium man rested yet, then? 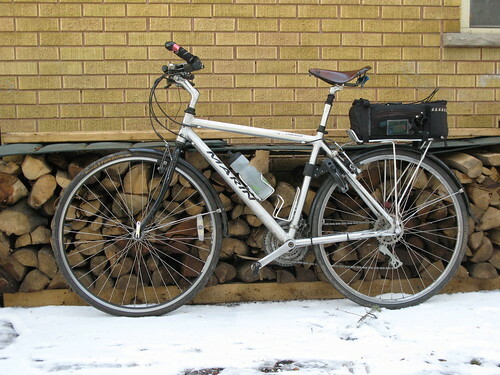 By the way, why are photographs of bicycles resting against cut wood so satisfying? Titanium Man is still on standby. It's only my old Marin commuter that is subjected to the abuse of winter salt and sand. There were two interesting observations from the ComputTrainer this year. First, when we mounted Lady CoMo on the trainer (using a special front fork mount) our combined wattage equaled the sum of our individual wattages. That is no surprise, but it confirms what one would expect intuitively. Second, my personal power has diminished by about 5% over the past 6 weeks. I attribute this to slothfulness – I was doing leg weight training (squats and hamstring curls) during December and January. Last weekend I had to overwork my aerobic system (i.e. heart rate) to make up for reduced muscle strength (i.e. lower wattage) and couldn't keep up with my January performance benchmark. Bad, bad, bad. Be careful what you wish for Kern. 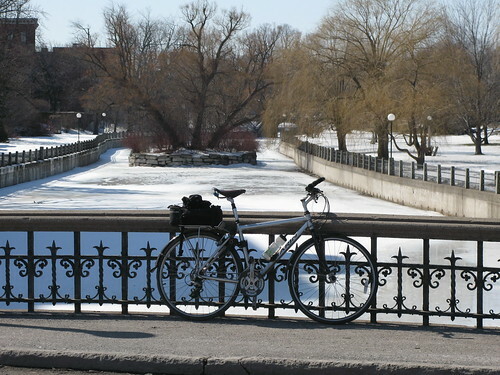 I love Canada, but boy oh boy, I dont think I could cope without cycling in winter. We had a very mild number ourselves, only having one slight sprinkle of the white stuff which had gone by mid morning, but enough to stop my cycling that day.